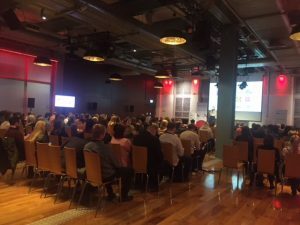 Our theme for IAB Connect 2019, held on 5th April, 2019 at the Guinness Storehouse was A Better Digital World. The agenda was designed to consider some key opportunities and challenges in building a vibrant sustainable digital advertising industry. We had a packed house of brands, publishers, agencies, platforms, adtech and measurement companies along on the day and a great selection of speakers and panellists. Suzanne McElligott, CEO, IAB Ireland opened the conference with a snapshot of the IAB Ireland PwC Online Adspend Report for 2018, she also welcomed Brands on board as members of IAB Ireland in 2019. Suzanne’s presentation is available here. Mark Corrigan, chair of our Mobile & Audio Council and Head of Client Strategy in Packed.House along with Jimmy Larsen, Director of Red C Research were up next with IAB Ireland’s brand new Research on Digital Audio: Listen Up Ireland. Check out the key learnings here with links to the full deck shorter infographic. Lisa Folkson, Account Director at Acast put some context on the research and shared a practical and inspiring ‘how to’ for podcasts in her presentation: Podcasts – The Ten Commandments. Please email maeve@iabireland.ie if you’d like to see Lisa’s presentation again. Emer Lawn and Finian Murphy, Core Media gave us an in-depth tour of Core’s Connected 2019 Research looking at the Connected Consumer. You can see more on this at Connected 2019 or contact Emer or Finian directly to find out more. Our panel discussion featuring Doug Farrell, Ian Maxwell, Steve Beckwith and Viv Maher were next and discussed their views on a better digital world. After a coffee break, we had Nicola Spooner, VP Strategy, Unruly who took us through the Unruly Connected Home project and Unruly’s predictions for the Future of Advertising. Nicola’s presentation is here. Following on nicely to that, Mark James, Director at Wavemaker gave us excellent advice on Getting the Right Voice for your Brand, and urged all brands to look at this now and be ready for growth in this area. Mark’s presentation is here..
Robert Sheehan, Media Manager from Lidl took us through how Lidl have moved online to complement their offline activities and how both can work together hand in hand. Check it out here. And last but by no means least Gerard Murnaghan and Joshua Sigler, Sprout Social took us through what a better social world looks like and the importance of Trust and Connections between brands and consumers. Check out their presentation here. And that was a wrap at the end of another insightful, interesting and inspiring conference. Thanks to all of our fabulous speakers and panellists and to our Conference Partners: Facebook, Google and PwC.